Goldstar is a home-electronics company owned by LG. The company sells a series of microwave ovens that are designed to appeal to budget-conscious homeowners who want basic microwaving capabilities without the fancier features of LG's more expensive microwaves. Learn how to install and operate a Goldstar microwave oven so you can quickly reheat or cook food at home without using a conventional oven. Goldstar manufactures a full line of microwave appliances for the modern homeowner. Set up the Goldstar appliance. If using a countertop Goldstar microwave oven, continue reading. If using an over-the-range microwave, skip to Step 2. Open the microwave's cardboard box and remove the oven. Set it up on a flat, hard surface with at least 12 inches of open space above it and 4 inches of space behind it to ensure adequate ventilation. Connect the microwave oven directly to an electrical outlet and avoid using an extension cord. Unwrap the appliance's glass tray from its plastic wrapping and place it on its plastic rolling ring inside the microwave. Install an over-the-range Goldstar microwave. Open the microwave oven's cardboard box and remove the oven and its installation kit. Review and follow its included installation guide, as each model differs slightly in its installation. Typically, you must first install a mounting plate under a cabinet and screw the plate into at least one wall stud. The Goldstar microwave is then bolted into the mounting plate and connected to an electrical outlet. After installing, place the microwave's glass tray on its plastic rolling ring inside the appliance. Calibrate the Goldstar microwave's clock. Press "STOP/CLEAR" on the top of its front keypad. Press "CLOCK," then "NUMBER." Push "CLOCK." Enter the time by dialing the numbers on the keypad. For example, press "2," "1," and "5" on the keypad if it is 2:15. The clock is a 12-hour clock and does not display "a.m." or "p.m."
Place food or liquids into a microwave-safe dish or wrapping. Goldstar recommends using heat-resistant glass or ceramic, microwave-safe plastic, and paper goods such as paper bowls or napkins. Arrange a single dish in the middle of the microwave oven's glass tray and close the appliance's door. Enter a cooking time on the front display. For example, press "5," "3," and "0" if you want to microwave the dish for five minutes and 30 seconds. Press the "START" button to begin the microwaving sequence. The oven will chime when it is finished. Open the front door and remove the dish. Use one-touch cooking, designed by Goldstar to save time. Place an item in a dish and put it inside the microwave. 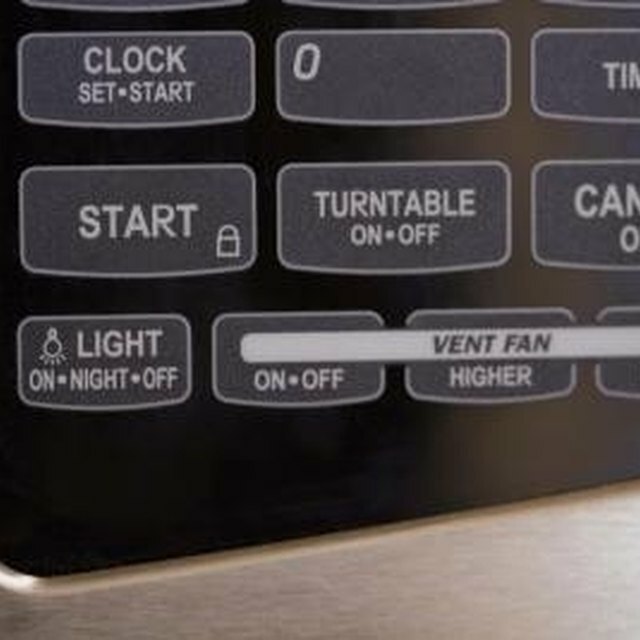 Press one of the one-touch buttons, designated by name for common microwaveable items. For example, press "PIZZA" to automatically begin reheating slices of pizza. The microwave will automatically sense the amount of time required and will chime when it is done. Turn on the microwave's child lock when you are away from the appliance and don't want your children to play with it. Press and hold the "0" on the appliance's front keypad for 10 seconds. The microwave's display will read "LOCKED." Press and hold "0" again to unlock the appliance. Don't place metal objects inside the Goldstar or any microwave oven.